a Livingston, Montana dude ranch. The 63 Ranch history dates from 1863 (hence the name), and in 1982 it was the first dude ranch in Montana declared a National Historic Site. Our Livingston, Montana dude ranch sits at 5600 feet altitude below Elephant Head Mountain, 50 miles north of Yellowstone National Park, 12 miles outside of Livingston. Making its home in some of the prettiest country in the west, the Ranch adjoins the two-million acre Gallatin National Forest, straddles Mission Creek Canyon, meets the craggy peaks of the Absaroka Mountains and the rolling across grassy hills, rimrock ridges and sagebrush benches above the Yellowstone River. The backdrop is breathtaking. Our family has owned and operated this Livingston, Montana Dude ranch since 1929, and look forward to sharing the ranch with you and your family. We welcome guests young and old, adventurous and relaxed, there’s something for everyone. Guest enjoy private cabins, home-cooked hardy meals, fishing, volleyball, horseshoes, billiards, square dancing, cards, games, swimming in the swimming hole, and of course exploring the countryside on horseback or helping wrangle cattle. Nearby, guests can enjoy the historic towns of Livingston, Virginia City and Nevada City. Rafting trips, Lewis & Clark Caverns, Custer Battlefield, and the spectacular Beartooth highway are also within easy reach. 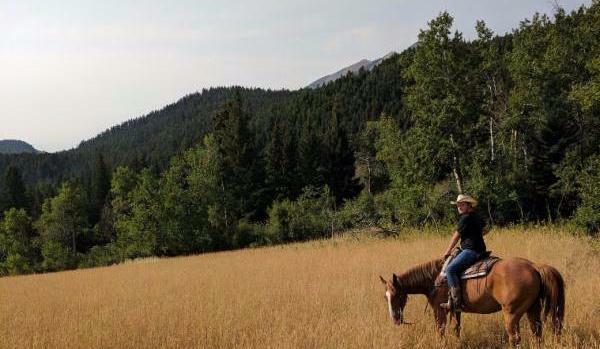 At the 63 Ranch it’s never a question of “what to do?”, it’s “is there enough time to do it all?” Our guests return again and again to add to their adventures at our Livingston, Montana dude ranch. We look forward to welcoming you to 63 Ranch, too.